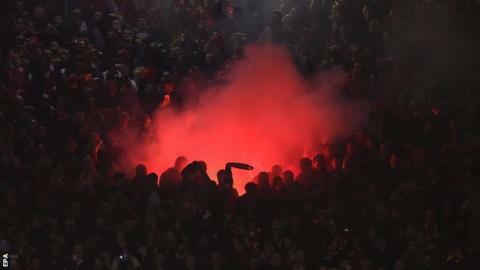 Liverpool are in more trouble with Uefa after European football's governing body charged them with a fireworks offence. The disciplinary charge came after a flare was thrown on to the pitch following last week's Europa League win over Borussia Dortmund. The Reds were already facing charges relating to fireworks offences and crowd disturbances in earlier rounds. A Uefa disciplinary panel will look at the charges on 19 May. The flare was thrown after Dejan Lovren's injury-time header saw the Reds beat Dortmund 5-4 on aggregate to book a semi-final against Spain's Villarreal. The Premier League club were also charged for illicit chanting, throwing objects and crowd disturbances, as well as further firework offences, following their last-16 victory over rivals Manchester United. And they received another charge after the quarter-final first leg in Dortmund for away fans allegedly blocking stairways. Liverpool's case will be heard by Uefa's control, ethics and disciplinary body on the day after the Europa League final in Basel.